December 10, 2014 - "Press Releases"
The copper and aluminum forging company has made strategic machinery investments to add capacity while maintaining industry-leading quality standards. Excellence in manufacturing is borne out of a commitment to finding new and better ways to provide solutions for customers. This relentless drive for excellence is what motivates Weldaloy Products Company to continue investing in new tools and equipment. Practically speaking, a copper forging specialist like Weldaloy is defined by two factors: the knowledge of their people and the limitations of their machines. With a highly qualified team of engineers, Weldaloy has a tremendous base of knowledge and experience. The most recent equipment investments continue to push Weldaloy well past the limits of most of their competitors. In recent months the company added another significant pieces of state-of-the-art equipment, a Doosan Puma 400. This new turning center is the fourth Puma 400 series purchased giving Weldaloy two identical cells for an ever growing work load. 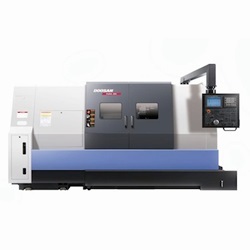 These machines are a perfect fit for small to medium size parts up to 22” diameter and operate with exceptional speed, accuracy, and performance.